Dawn breaks cold and damp on the edge of a European forest as old as history itself. Last night, your scouts stumbled upon the remains of a hastily departed Goblin camp. Sure enough, this morning their Crescent banners are silhouetted against the horizon, joined by a colorful sea of English pennants flying high above companies of noblemen on their war mounts. Will the forthcoming battle unfold as planned? Are your vaunted Dwarven mercenaries worth their costly wages? If you've chosen wisely, your place in history seems assured. If not... surely your heirs will pay the ransom... won't they? In a world that bridges history and fantasy - BattleLoreâ„¢ puts you in command of a vast array of miniature troops on the battlefields of Medieval Europe. Assembling a group of wizened old Lore Masters - men of faith and magic, tricksters and grizzled warriors - is only one of many challenges you'll face. The proper deployment of troops, careful choice of allies, timely spell-casting and good old-fashioned treachery are all important skills to master! The doorway to epic fantasy adventures, BattleLoreâ„¢ lets you relive the best of your role-playing experiences with family and friends, for an hour or an evening of fun. Never played wargames before but I'm glad we grabbed a copy before they ran out. A great 2 player game that's not too heavy and has very clear objectives...kill the other guy's troops and collect the flagbearer. Played the first scenario and it was fun. Lots of scenarios included for replayability. Hope to play more, very soon! When I first got this I put off playing it because it seemed very complicated. However, we finally bust it out to play and it's a lot of fun! The miniatures are great and the gameplay is very easy and engaging. Highly recommend this 2 player game. 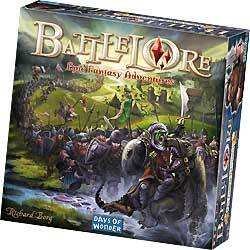 BattleLore is a great war game that uses the Commands & Colors system. On top of that, it adds a fantasy element with Lore to allow for magic and monsters. The base game is 2-player, but that can be increased with the Epic expansion.